An electric spark between Renault and La Poste! 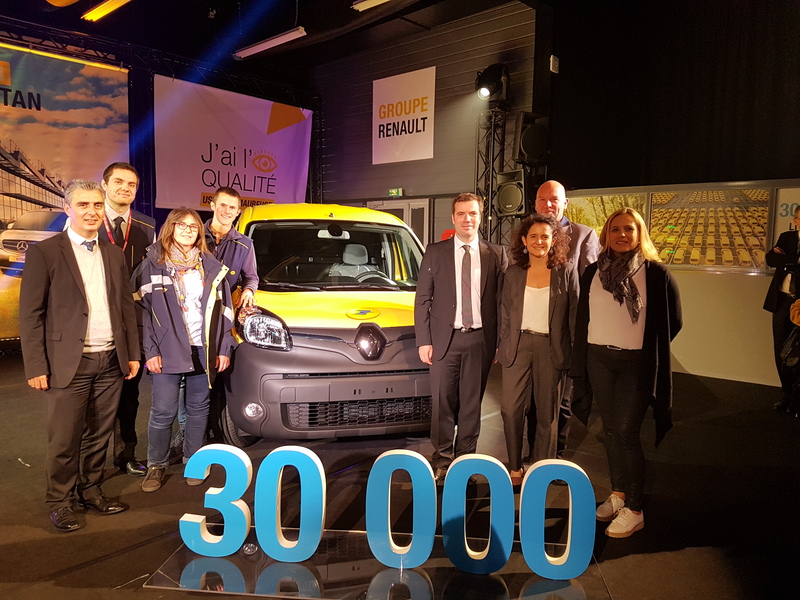 The Maubeuge Renault plant invited La Poste employees to celebrate its 30,000th Kangoo Z.E. on 20 October. The 30,000th Kangoo Z.E. from the Maubeuge Renault plant: the preferred electric van among French mail carriers. The Maubeuge Renault plant has just produced its 30,000th Kangoo Z.E., the electric van that is so well loved by France’s mail carriers. On 20 October, Guillaume Berthier, Sales Director at Renault Z.E., took the opportunity to hand over the keys to Bertrand Tellier, postman at the mail delivery and preparation centre in Petite-Forêt. Six years after the first electric version of the Kangoo went on the market, the Z.E. is the best-selling utility vehicle in Europe, and holds 80% of the electric van market. “We started by testing the Z.E. in large fleets like La Poste's to learn and improve on our vehicle”, Guillaume Berthier added. He then gave the keys to the electric van to Charles Poutiers, Technical Director at La Poste, and to Bertrand Tellier, Mail Carrier Ambassador for the Nord department, to the applause of his colleagues from the Maubeuge mail centre (Marie-Christine Leleux, Jonathan Flamme, Mickaël Malaquin, and Christelle Pelloquin, Maubeuge Site Manager) and the Services-Mail-Parcels Director for the Nord department, Nathalie Lagrenée.